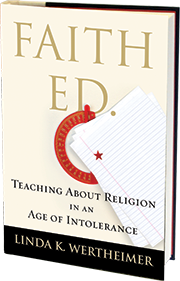 It’s Publication Day for Faith Ed! 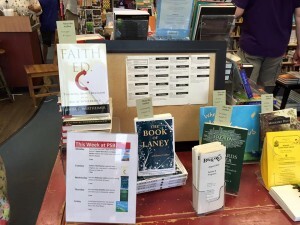 Yes, today is the day – the day you can actually buy Faith Ed. from anywhere books are sold. A request: If you see it in a bookstore where you live, please take a photo and email it to me at linda@lindakwertheimer.com. I’d love to get a sense of where it’s appearing. Alternatively, if you’re not shy about others seeing your mug, take a photo of yourself with your copy – and I’ll share it in a future newsletter – and on my FB page. So what’s going to happen today? If you’re in the Boston area, you can hear me give my first talk about Faith Ed at Porter Square Books in Cambridge, MA, conveniently located near the T station. I’m putting the final touches on a slide show that I’ll use with my talk. The exciting news to report: Porter Square Books has about 60 chairs on hand. Based on RSVPs, they’re ordering enough chairs to accommodate 100 people. Couldn’t make me happier to have a big crowd to share this moment tonight. But what if you can’t come tonight? No worries, I have plenty of speaking engagements lined up in the Boston area over the next several months – and others starting to be scheduled around the country. Find the latest events on my events page. 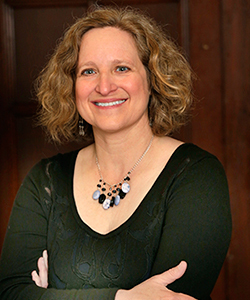 Interview with Publishers Weekly Religion Writer: Publishers Weekly yesterday published an interview with me about Faith Ed. and some of the themes in the book. You can read it here. What happens post launch? Some friends have wondered if things slow up after publication day. Quite the contrary. Not only will I be doing speaking engagements, but this is when requests for radio/media interviews start to come in. First up: I’ve been invited to chat about the book on Think, a public radio show on KERA in Dallas. If you’re in the Dallas area, tune in on Wednesday, Aug. 19, at Noon CST. Elsewhere, they turn it into a podcast so everyone can hear it. Will the newsletter continue now that the book is about out? Yes! I want to keep my connection with my loyal followers and keep you up to date on reviews, articles, interviews, you name it. Many more to come in the weeks, months ahead. Ps. If you’re on Instagram, I’ve created a new Instagram account. Find me here. I’ll be posting some photos from the launch on there and using it to chronicle other fun things on this amazing literary journey. Tagged Beacon Press, Faith Ed, KERA, Krys Boyd, Porter Square Books, THINK. Bookmark the permalink.